All my life I’ve dreamt of running a marathon, but I’ve never got round to it. There are all kinds of reasons why I’ve never signed up for one – including laziness, and the fact I’m rubbish at disciplined training regimes – but the main thing that has been holding me back has always been my IBD, and now that has all but vanished I guess I’ve run out of genuine excuses. As you have probably gathered I’m no couch potato. Even at the height of my most serious flares I have forced myself to do exercise, sometimes with disastrous consequences, including fainting and blackouts. I’ve learnt the hard way that pushing your body to the limit when you have lost a serious amount of weight and your body is already battling to survive can be incredibly dangerous. But I have always, and will probably continue to have, had a very stupid habit of ignoring my body’s cries for help – I almost seem to be hell-bent on punishing myself for everything, even when there is no reason to. I’m no fitness fanatic, but I love exercise. At times I am lazy but most of the time I live to swim, dance, run, basically anything that gives me that satisfyingly free feeling. Exercise makes me feel good about myself. And, at times, when my illness has been at its height, it has helped; mostly as a distraction from the pain, but often as just a way for me to relax and let off steam. A few years ago I swam 120 lengths every single morning (or evening). I was the fittest and most relaxed I had ever been, and I did find that it helped me to manage my illness, simply by relieving some of the stress from work – the problem is I did go a little bit over the top with it. If you don’t believe the full extent of my pig-headed stubbornness, what follows is an example of me pushing myself to the extreme. 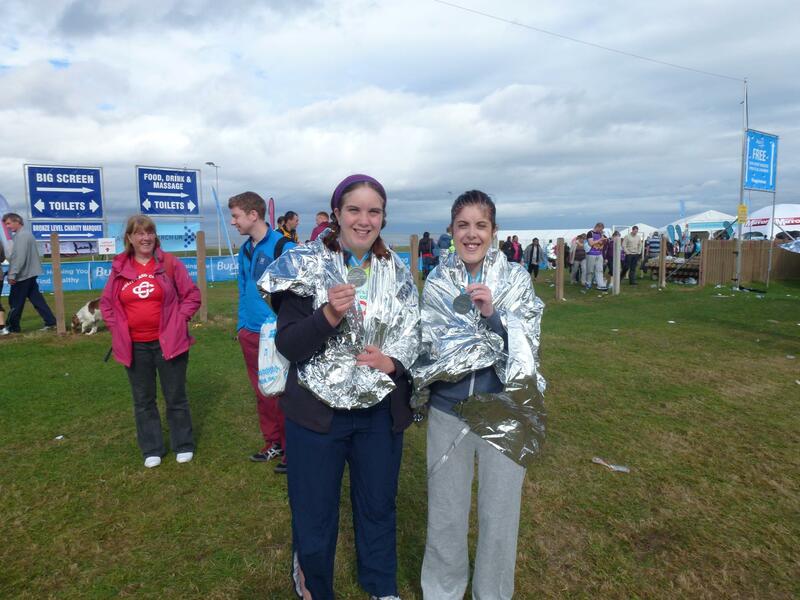 At the hight of my last full flare, in the year leading up to my operation, I ran The Great North Run. Yes, great idea Rachel. I struggled around the whole course, my whole body feeling like it was going to disintegrate into the tarmac. If it hadn’t have been for the amazing people who were also running for Crohn’s and Colitis UK who ran next to me, shouted words of encouragement and told me their stories, I probably would have given up a quarter of the way round. I needed the toilet constantly and had to force myself to keep running, made even harder by my injured leg wrecked by a crippling bout of cramp the night before, which left me hardly able to walk on the morning of the race. Hobbling (well crawling) over the finish line was one of the proudest moments of my life. I’ve never felt so relieved. I could hardly speak, move or breathe, (and struggled for days after) but weirdly enough, despite the pain and agony, a part of me wanted to do it all over again. I guess the exhilaration and sense of achievement is addictive. That was my first competitive run. I’ve often thought of doing another, potentially a longer one, but I just couldn’t begin to comprehend how my Colitis would cope with a run like that again. On the day of the GNR I had to do everything in my power to keep my body in order and my diarrhea at bay. Often the pain in my abdomen was agonising and it took all the will I could muster to not give up. I can’t imagine what would have happened if that had been a marathon – no number of toilets in the world would have been good enough in that situation – I would have either given up or died trying. But now that I have my stoma things are very different. Yes, I guess I am still within the recovery period and so shouldn’t be attempting anything ridiculous, but in the past few weeks I have started to run again and it feels fantastic. I’m almost back to the fitness levels I had before, and I’m more motivated than ever. Yesterday I got up at 7.30am (yes on a Saturday) and ran 2k (I know that’s not far) averaging six-minute a Kilometre – which for me is pretty damn good. I feel happier, I’m eating better, and putting on weight, which after being so tiny for so long is a weird feeling and one that is a massive learning curve to get used to. Ok, last year I did the Santa Dash (so a little bit of a competitive run) for The Countess of Chester BabyGrow Appeal. 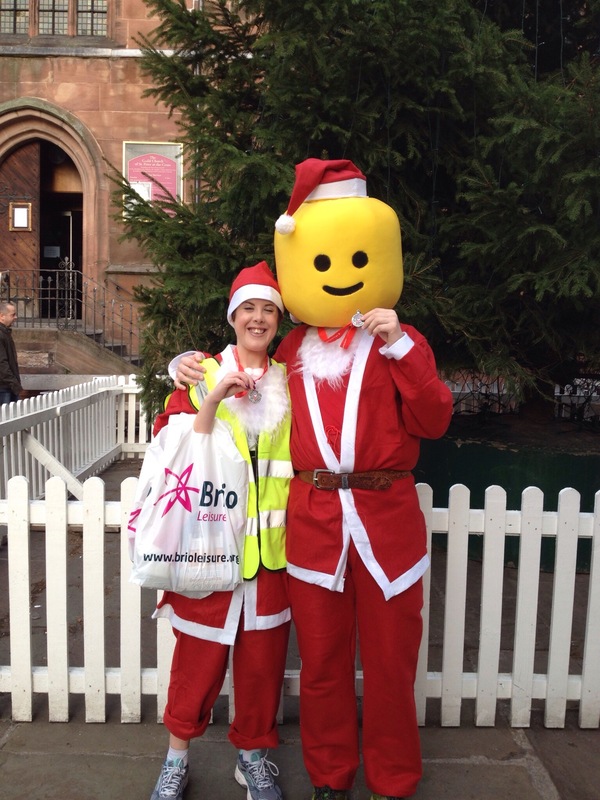 Which was exhausting as we were boiling in our outfits and I dragged Andy along as a lego man!!! But that’s no marathon, it’s more of a sprint. But now, I’ve decided it’s time to start planning for my Challenge 66. Steady on, I hear you say, wasn’t Challenge 66 Cheese Rolling? Yes, it was, but I realised the other day that cheese rolling is part of the Visit England Challenges – massive error to duplicate challenges – so I have changed it to a marathon. Whether this was a size move remains to be seen, but it is on the list now, so as they say my fate lies with the Gods. I’m taking this very seriously. I’ve bought myself a Garmin watch (other brands are available) and I’m going to be sharing my progress, good and bad, with you. I aim to run at least three times during the week and once at the weekend, and hope to do at least 12K every week, come rain or shine. But I need your advice. 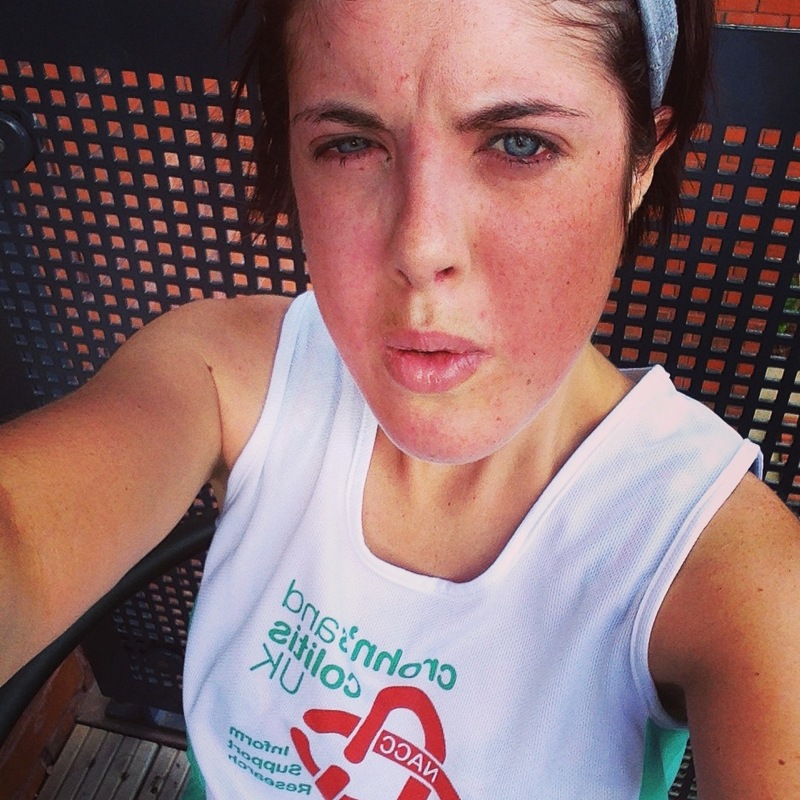 I’m obviously going to be running for Crohns and Colitis UK, but I also want to raise cash for Ostomy Aid, so the big question is, which marathon should I do? Let me know which ones you have done and which have the best routes, atmosphere etc? I wouldn’t mind doing one abroad, as long as it isn’t too hot, cold, or humid that is. I mean I may swell get a holiday out of it, right?